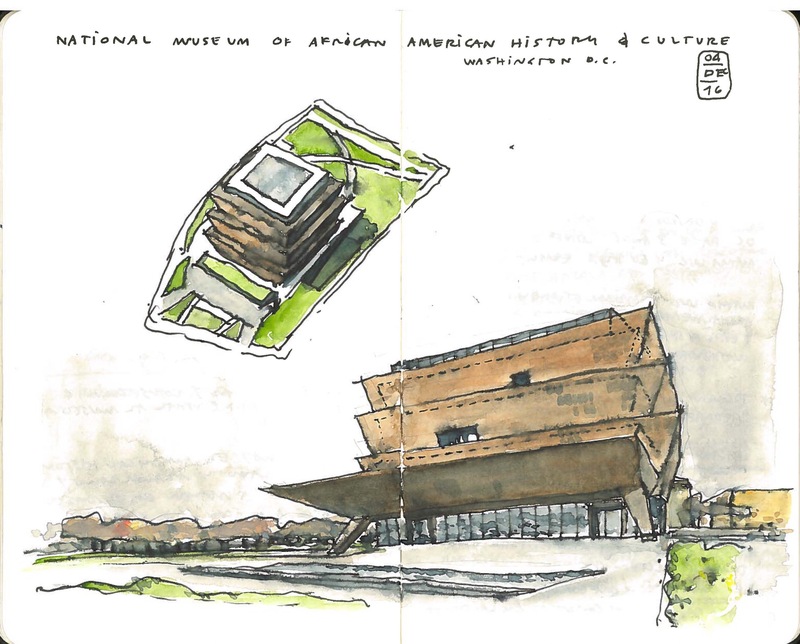 Designed by David Adjaye (in collaboration with Philip Freelon and Smithgroup) and completed in 2016. The museum exhibits are divided into two general areas, contemporary culture and the history and vicissitudes of African Americans. The contemporary are displayed at the main volume — a glazed cube protected by the bronze architectural scrim that forms the ’corona’; the main volume visible from the National Mall. In contrast, the historical exhibits are gracefully displayed deep underground — not as if hiding them — but as a powerful remembrance of what — still to this day — lies buried deeply in American History. The surrounding landscape was designed by Gustafson, Guthrie & Nichol of GGN. The grounds not only becomes a plinth where the museum rests but also creates a solemn space to reflect on what was viewed inside.